Our friends at Silk sent a box full of new cases (and mock iPhones, but that’s another story…) last week, and we’ve just had a chance to take a look at all of the products they’ve created for the iPhone XS (which also fit the original iPhone X), XS Max, and XR. Silk’s cases are available both on Amazon and at their website. Let’s take a look! 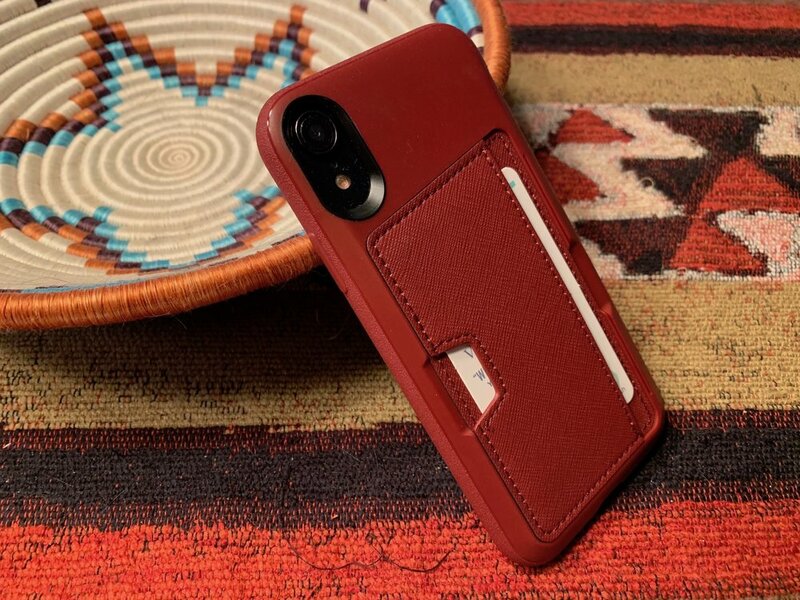 The Wallet Slayer is a wallet case line from Silk, and Volume 1 consists of products for the iPhone X, iPhone XS and iPhone XS Max. The back of the case has a slot that can hold three cards — a mixture of ID and credit/debit cards — and some folding cash. The sides have a slight texture to give you a better grip on the phone, and the pass-through buttons actually have a much better tactile response than the usual “mushy” buttons. The Wallet Slayer Volume 1 (Amazon affiliate link) comes in “Black Tie Affair”, “Red Rover Red Rover”, “Blues on the Green” and the “Flavor of the Month”, and the company makes even more designs available on Amazon. The price? A very reasonable $14.99, which includes a screen protector film. Sure, the Wallet Slayer Vol. 1 is handy, but you might not like the all-polycarbonate construction. That’s where the Wallet Slayer Volume 2 comes in, with a much more cloth-like card slot cover. It also performs magic — if you take one of your credit cards and put it into a thin channel at the “mouth” of the card slot, you have a kickstand for your iPhone and can watch your choice of content hands-free. Wallet Slayer Volume 2 (Amazon affiliate link) is available in the same colors for the iPhone X, XS, XR and XS Max. With the screen protector, the Wallet Slayer Volume 2 is an affordable $24.99. I’ve gotta admit, Silk makes it interesting for those of us in the tech blogging business with their product names and humorous descriptions. Kung Fu Grip! (Amazon affiliate link) is an inexpensive ($11.99) case with a very grippy texture to help avoid drops. Like the rest of the Silk cases, it features air-pocket corners that Silk describes as “air bags for your iPhone”. Kung Fu Grip! is one of the more thin designs from Silk, and once again includes a screen protector. For $12 this is one of the better case deals for the iPhone X, XS, XS Max and XR. With a perfect name for a minimalist case, the Nudist (Amazon affiliate link) has a clear frosted finish in the “Nothin’ to Hide” model, and also comes in the “Chef’s Special” and “Flavor of the Month” designs with more popping up all the time on Amazon. It’s just $11.99. Are you into folio-type iPhone cases? Then you’ll love the Silk Keeper of the Things case (Amazon affiliate link) since you will pay only $14.99 for a case that can fit 4 cards, cash and “anything else. you can wedge into the pockets”. It comes in the standard “Black Tie Affair” finish, as well as a pink (no, I’m not going to call it 'rose gold’) “Rosé All Day” finish. Using a textured fabric for a nice grip, it also has a security band to keep the folio closed while being carried and even comes with a wrist strap. If you’re considering a Silk case for your new iPhone, consider purchasing it through one of the links above as we get a small amount of remuneration for each Amazon purchase.